Manufactured by Vitasoy in Hong Kong this Vita Guava Juice Drink sounded like a Summery tropical taste sensation. I've drank plenty of tropical juice drinks before and I'm sure guava was in their ingredients, I have also tried a pure guava juice drink in a can by a different make before, so I wanted to see if this little carton was just as refreshing. 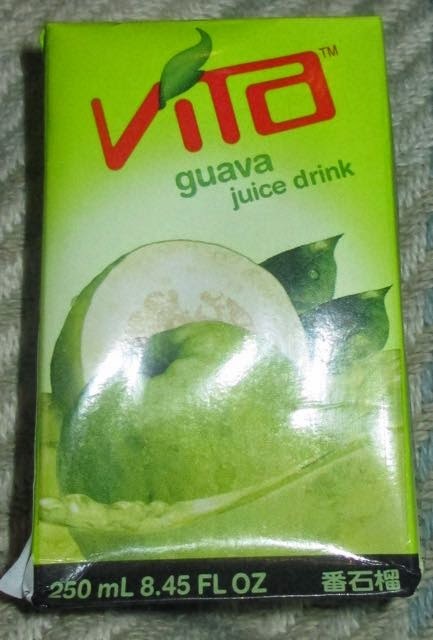 On first taste I noticed this Vita Guava Juice Drink tasted slightly different. It was not as sweet and syrupy, and had more of a natural fruity guava flavour. I have to admit it was still very refreshing and also refreshingly different than our fruity soft drinks that you can buy in regular supermarkets and corner shops. Give this a try, it's different, refreshing (did I already say that?) and healthy feeling. It's a quick fix step away from the norm. 250ml with 125 calories, 0g of fat and 31g of sugar. Ingredients include; water, sugar, Guava purée (minimum 5%), ascorbic acid (E330), natural and artificial flavouring, and high in Vitamin C.